The North Atlantic in terms of passenger travel was about to change. On 20 July 1969, as part of the Apollo 11 mission, Neil Armstrong became the first to accomplish the dream of man walking on the moon, to be followed only minutes later by Buzz Aldrin. 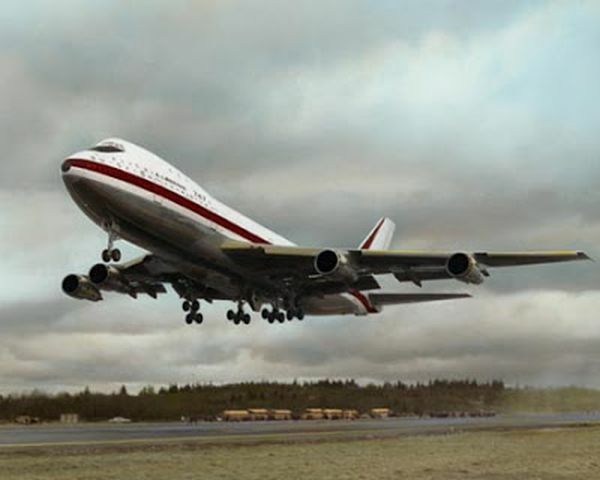 The Boeing Jumbo has been an enormous success and is still in production, albeit in very much updated form, especially in the engine department with advanced quieter and much more efficient powerplants. Concorde was a technological triumph but would have no place in society today due to its environmental impact. The same people who stood in awe all those years ago as the aircraft flew by overhead would now be out complaining about the noise and pollution. The QE2 was built to replace the ageing sisters Queen Mary and Queen Elizabeth on the run to the Statue of Liberty. Cunard must have realised the game was up when first the Comet and then the Boeing B707 entered the travel market between Europe and the US in 1958, but ploughed on with the new ship, the government covering two-thirds of the cost by an attractive loan. Some of the dreams of 50 years ago are still dreams. Some such as Concorde and QE2 have run their course. Happy birthday, Boeing B747. Have many more. I have raised the issue of picture resolution previously and fully support Graham's comment. I like the fact that btnews now enlarges to fit a readers screen size, but it would be much better if higher resolution images could be used?